Losing Sanity: Losing Beauty is in Print!! Oops, I guess you don't need to guess if you read the title of this post. That's right! Losing Beauty is in print!! It was just kinda fun to write it twice because it's a big deal! It's something I've been working towards for years and now I can hold it in my hand. 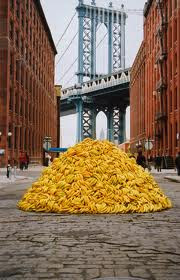 It's modern art crazy-as in bananas. ﻿What happens now? For those of you who have been patiently awaiting the print version to be released, Thank You! Your email messages, Facebook comments, Tweets or actual face-to-face communications that you were dying to read the book, but prefer to read it in the print version mean so much. Writers, as a group, tend to be [insert any one of the adjectives for crazy used above] about their work. Your kind words mean a lot. Below is a quick list of Q&A that attempt to answer most of the questions I've received. When will Losing Beauty be in my local book store? That depends on where you live. Broadway Books in Portland will have it in stock by the end of the week. However, if you don't live in Portland, OR your best bet is to purchase a copy from an online source. The book has to work its way through the acquisitions editors of every major chain before it will show up in the store. If you’d like to see it in your local independent book store or large chain store, it might make a difference (a big difference) if you request it. Will you be doing book signings? Yes! Rest assured I will Tweet, Facebook, Blog and G+ any scheduled book signing. I might even send out invitations. In fact, I'm sort of sensing a whole wine and cheese opportunity and you all know how much I love wine and cheese!! Will you come to my book group? If you live in the Portland area I would be honored to visit your book group. If not, email me anyway. Maybe we can come up with something creative. When, oh when, will Losing Hope be released? According to my publisher, March 2012—at least that’s what it says in the back of Losing Beauty where a sneak peak at the first chapter of Losing Hope is provided. I think that covers most of the questions I’ve heard, but if you think of something else just send me an email or leave me a comment. One more thing that goes, almost, without saying. Thank you so much for your continued support and for reading, not just Losing Beauty but everything. Reading is the best kind of vicious circle. The more you read, the more demand is created, thereby ensuring continued quality reading material. You keep reading and, rest assured, I'll keep writing! Did you guys go with a print run or POD? What discount did you offer retailers? Congratulations Johanna, that's brilliant news! SB, even though I feel like I should know the answer to that question, I don't. It's probably better directed at FIBP. You can contact them at the website listed in today's blog. Congratulations! Nothing beats seeing your book in print for the very first time. Or seeing it in a store. First time I saw mine in Barnes & Noble, it was surreal. Enjoy! Congrats on the book release! Have fun at your signings - move around and talk to people. Much better than just sitting there. Trust me.